Please join my list of Linky friends and google friends when you visit my blog! Thanks! I saw Redneck wine glasses in a Hallmark store and thought what a clever idea. However, they did not have handles. I googled the company and found that they also offer Redneck wine glasses with handles and they are considerably less expensive online, even with shipping. These glasses came with a pewter lid but I thought I would switch those out for regular mason jar lids which I could spray paint with chalkboard paint. First I roughed up the surface with fine grit sandpaper. Then I simply spray painted the inside lid of the caps. Now each cap can be labeled with the guest's name. And they look great displayed in our wine cabinet! These Redneck glasses can not go into the dishwasher. However, check out this blog, Blooming With Burlap, where Jennifer came up with a way to make her own Redneck glasses and hers are dishwasher safe. Cheers! I saw these down in Branson this weekend -- and then here they are to make your own! So cute! Thanks for joining us at the CHQ Blog Hop tonight! I'm your newest follower! We hope you meet some great new bloggy friends! We received some of these as housewarming presents, they were such a neat idea! Great idea with the name tags! Your wine case is lovely!! I like the 'fun' wine glasses. Some wine drinkers take it all so seriously. My husband sometimes drinks HIS wine from a beer mug and we have been known to use red Solo cups!! Fun like a PARTY!! I made each of my kids a set for Christmas last year using Mason jars from my mom and candlesticks from yard sales. These are cute! I've made some similar to this but mine didn't have the handle or the chalk board top. I'll have to keep that chalk board top in mind next time. It's really neat! Now following. Love from Whimsically Homemade. hi. i'm following the "welcome wednesday" blog hop. i would love for you to visit my blog and follow if you like it. Thanks for linking my post to your blog. I love the chalk paint idea and your wine cabinet is beautiful. I love that you modified them to have the chalkboard tops ... you could really have fun with what you write on the lid! So cute! Love how these turned out! Thanks for sharing at the Pomp Party! Pinning to our Pomp Party board! 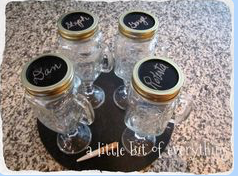 I love these, they are so much more clever than then ones I saw in the store:) The chalkboard lids are just perfect! Thanks for sharing at Freedom Fridays. Love that chalk paint. So many great creative things to do with it. Wonderful to have you with us at Seasonal Sundays. Just stopped by from the Finding New Friends Weekend Blog Hop and started following your blog! I hope to have you stop by and visit soon! what interesting name for the wine glasses. the chalk is a versatile idea! I saw these somewhere and thought they were so fun. I love how you painted the seals with chalkboard paint. Clever! Thanks for sharing with Share Your Cup. Fun! I love that blackboard paint idea. I saw your link at Nan's: Mom's The Word. Cute glasses! Love how you personalised them! Hiya, I found your blog on 'blog hops everday' and I am now following you. But more to the point, your blog made me sigh up to Linky. Not sure how it works yet, but willing to explore. I love your redneck wine glasses - bloody brilliant! Wow what an amazing idea! Thanks for sharing these, they would make fantastic gifts. Hi! I just nominated you for the Versatile Blogger Award! Love the blog!